In order to keep from being overwhelmed, it's important to select a few key metrics that you'll monitor on a consistent basis, starting with total visits, unique website visitors, traffic sources, landing page visits and landing page conversion rates. Total Visits -- The Total Visits metric lets you know how many times your website was viewed, which includes multiple views from the same guest. It provides a baseline of information on how much attention your site is getting. Dramatic changes in this metric can indicate serious issues. Unique Website Visitors -- Unlike Total Visits, Unique Website Visitors focuses on the number of different visitors who have come to your website or a designated landing page. Most often, a unique visitor is based on having unique IP address information, though this metric is often an estimate. Landing Page Visits -- The number of times someone visits your landing page from another domain (could be a social media site or from an ad). Drops in this metric indicate a problem that needs to be resolved quickly, because it can influence your traffic for a week or more. Traffic Sources -- The Traffic Sources metric identifies the sources, like social media or advertisements, that drive the most traffic to your website. It shows you the sources that effectively draw in potential customers, as well as those that are less effective and need to be revised or even dropped. Bounce Rate -- Bounce Rate is the value of sessions where a visitor only views one page out of all visitor sessions on your website. Depending on your goals, a high bounce rate can be a strong signal of issues, especially if a conversion requires guests to visit more than one page. Time on Site -- Also known as Session Duration, this metric is based on all Session Durations divided by the number of sessions. This metric can provide information on how much time visitors are spending on your site, which shows how engaged they are -- and therefore likely to become a lead or customer. However, because it doesn't include the last page, it's not as high a priority as the daily or weekly metrics. Pages Per Visit -- This metric is another way to measure the overall engagement of your visitors, how interested they are in your content, products or services. A large average number of pages per visit paired with a very short time on site can indicate that your visitors aren't finding what they are looking for on your site. Landing Page Conversion Rates -- The goal of a landing page is to convince a visitor to convert, whether that conversion means exchanging their contact information for a free download or completing a purchase. Your conversion rate is one of the most important factors in measuring the success of your marketing campaigns. 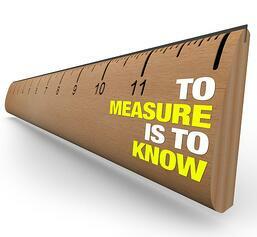 The right metrics can provide valuable insights on your online marketing campaigns and strategies. By focusing on key performance indicators and reviewing them on a regular basis, you can make the most effective use of information that these metrics offer.